The Ildegizids, Eldiguzids (Turkish: İldenizli Atabeyliği, Azerbaijani: Eldəgəzlər, Persian: ایلدگزیان‎‎) or Ildenizids, also known as Atabegs of Azerbaijan (Persian: اتابکان آذربایجان‎‎ Atabakan-e Āzarbayjan,Azerbaijani: Azərbaycan Atabəylər Dövləti) were a dynasty of Kipchak origin which controlled most of northwestern Persia/eastern Transcaucasia, including Arran, most of Azerbaijan, and Djibal. At their extent, the territory under their control, roughly corresponds to most of north-western and upper-central modern Iran, most of the regions of modern Azerbaijan and smaller portions in modern Armenia (southern part), Turkey (northeastern part) and Iraq (eastern part). Down to the death in war 1194 of Toghril b. Arslan, last of the Great Seljuq rulers of Iraq and Persia, the Ildenizids ruled as theoretical subordinates of the Sultans, acknowledging this dependence on their coins almost down to the end of the Seljuqs. Thereafter, they were in effect an independent dynasty, until the westward expansion of the Mongols and the Khwarazm-Shahs weakened and then brought the line to its close. Atabeg (literally means "fatherly lord" in Turkic) was the title conferred upon the Turkic officers who served as guardians of minor Seljuq rulers. In the political circumstances of the time, Atabegs were not only tutors and vice-regents of their princes, but also de facto rulers. At the height of Eldiguzid power, their territory stretched from Isfahan in the south to the borders of Kingdom of Georgia and Shirvan in the north. However, closer to the end of their reign amidst continuous conflicts with the Kingdom of Georgia, the Eldiguzid territory shrank to include only Azerbaijan and eastern Transcaucasia. In 1136, Sultan Mas'ud appointed Shams ad-Din Ildeniz (ca. 1135/36 – 1175) to be an atabeg of Arslan-shah, the juvenile successor of the throne and transferred Azerbaijan to his possession as iqta. Eldegiz chose Barda as his residence, and attracted the local emirs to his camp. From 1161, the Seljuq princes at Hamadan fell under the control of the Atabeg of Azerbaijan. Shams ad-Din Ildeniz became the ruler of the remainder of the north Iran and South Caucasus of the Seljuq empire. He was taking every measure to consolidate the power of his own appointed, but powerless sultan. The word Azam (meaning "great") was added to his title and he was also known as "Atabek-e Azam". All of the state’s subsequent rulers used to hold this title. During his reign, Ildeniz could subdue a spacious territory between the Caucasus and Persian Gulf. The territory belonging to him stretched from the gate of Tiflis up to Mekran. He had possessed Azerbaijan (Iran), Arran, Shirvan, Djibal, Hamedan, Gilan, Mazandaran, Isfahan and Rei. The Atabegs of Mosul, Kerman and Fars as well as the feudalists of Shirvan, Khuzestan, Hilat, Arzan-ar-Rhum and Maraga became his liegemen. Georgia, whose army was strengthened by 40,000 Kipchak Turkic warriors, was the strongest antagonist of the Shams al-Din Ildeniz. In 1138, Georgian king Demetre I, attacked the earthquake-ridden city of Ganja. While leaving the city, his troops carried off the well-known iron gate of Ganja as their trophy, which up to this date remains on display at the Gelati monastery. From 1161 onwards they began to make plundering raids on Ani, Dvin, Ganja, Nakhchivan and other regions controlled by Atabegs. Ildeniz formed a union with other Seljuqids in the beginning of the 1160s to fight against the Georgians, and in 1163 the allies inflicted a defeat on king George III of Georgia. In response to this defeat, the king of Georgia occupied Ganja in 1165. The Georgians took several fields in Azerbaijan and they could reach such faraway cities as Nakhchivan and Beylakan. As a rule, Georgians used to be paid their tribute and then they left. In 1173, Atabeg Ildeniz began his big campaign against Georgia but he was defeated. Atabeg’s troops retreated and Ildeniz died in 1174 in Nakhchivan. After the death of Shams al-Din Ildeniz, in 1175, the Seljuq Sultan Arslan Shah tried to escape from the yoke of the Grand Atabeg of Azerbaijan but failed, and was poisoned to death by Shams ad-Din's son, the new Grand Atabeg Mohammed Jahan Pahlavan (1174–1186). Pahlavan transferred his capital from Nakhchivan to Hamadan in western Iran, and made his younger brother, Qizil Arslan Othman, the ruler of Azerbaijan. 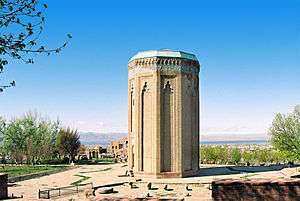 In 1174, Qizil Arslan captured Tabriz, which subsequently became his capital. Jahan Pahlavan suppressed all rebellious emirs and appointed faithful mamluks to key positions. He apportioned each of them any region or town as iqta.The twelve years of his rule are considered the most peaceful period of the state’s existence. Under his reign the central power was strengthened and no foreign enemy invaded the territory belonging to the Atabegs. Friendly relations with Khwārazm-Shāhs, the rulers of Central Asia, were founded. All those facts had positive influence on the development of science, handicraft, trade and arts. After Muhammed Djahan Pehlevan’s death his brother Qizil Arslan (1186–1191) ascended the throne. He continued his successful struggle against the Seljuq rulers. At the same time the central power began to get weaker as mamluks who had strengthened their power in their allotments did not want to obey the Sultan. Even Shirvanshakh Akhsitan who used to be Atabegs’ liegeman decided to benefit from the weakening of the Atabek’s power and invaded his territories in 1186. But he was defeated. His troops had to flee in pursuit of Atabeg’s army. They reached Baku. At the same time Qizil Arslan occupied all the land of Shirvan lying between Shamakha and Derbent. In 1191 Toghrul III, the last Seljuq ruler was overthrown by Qizil Arslan. Then, by Khalif’s leave, he proclaimed himself a Sultan. The same year Qizil Arslan, who had become the individual ruler of the Great Seljuq Empire was, assassinated. The power was divided among his three sons: Abu Bakr, Qutluq Inandj and Amir Amiran. Abu Bakr governed Azerbaijan and Arran, and his brothers were the rulers of Khorasan and several neighboring regions. Soon, these three successors began to fight for the throne. And Abu Bakr was the one to win this war. But the State’s defense capability was stricken. Khorezmshahs' and Georgians’ non-stopping forays aggravated the situation in the country and speeded up its decay. This process was speeded up during the reign of Atabeg Uzbek (1210–1225), who was enthroned after Abu Bakr’s death. In that period, Hassan Djalal the Mihranid (1215–1262) began his separative activities, a fact which shook the fundamentals of the weakened State, with the result that it was invaded by the troops of Georgian Queen Tamar. The troops occupied several Azerbaijani towns but they had to return to Georgia. The Atabeg State fell in 1225 when it was included into the Khwarezmian Empire. 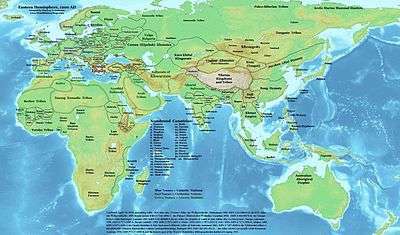 Finally the area of it passed to Mongol Empire in 1231. Much like the Seljuqs, under the Eldiguzids, Persian culture and literature flourished and Persian was the primary language. See also Nozhat al-Majales for many of the poets of the area. ↑ Lewis, Bernard (1994). Sir Hamilton Alexander Rosskeen Gibb, ed. Encyclopedia of Islam. 10. Brill. p. 554. 1 2 3 4 5 6 7 8 9 C.E. Bosworth, "Ildenizids or Eldiguzids", Encyclopaedia of Islam, Edited by P.J. Bearman, Th. Bianquis, C.E. Bosworth, E. van Donzel and W.P. Heinrichs et al., Encyclopædia of Islam, 2nd Edition., 12 vols. with indexes, etc., Leiden: E. J. Brill, 1960–2005. Vol 3. pp 1110-111. Excerpt 1: "Ildenizids or Eldiguzids, a line of Atabegs of Turkish slave commanders who governed most of northwestern Persia, including Arran, most of Azarbaijan, and Djibal, during the second half of the 6th/12th century and the early decades of the 7th/13th century". Excerpt 2: "The Turkish Ildenizids shared to the full in the Perso-Islamic civilization"
1 2 3 4 5 6 7 Bosworth, Clifford Edmund (1996). The New Islamic Dynasties: A Chronological and Genealogical Manual. Columbia University Press. pp. 199–200. ISBN 0-231-10714-5. pp 199-200(Eldiguizds or Ildegizds): "The Elgiguzids or Ildegizds were a Turkish Atabeg dynasty who controlled most of Azerbaijan(apart from the region of Maragha held by another Atabeg line, the Ahamadilis), Arran and northern Jibal during the second half the twelfth century when the Great Seljuq Sultane of Western Persia and Iraq was in full decay and unable to prevent the growth of virtually independent powers in the province", pp 199-200: "Eldiguz (Arabic-Persian sources write 'y.l.d.k.z) was originally a Qipchaq military slave", pp199-200: "The historical significance of these Atabegs thus lies in their firm control over most of north-western Persia during the later Seljuq periodand also their role in Transcaucasia as champions of Islamagainst the resurgent Bagtarid Kings". pp 199: "In their last phase, the Eldiguzids were once more local rulers in Azerbaijan and eastern Transcaucasia, hard pressed by the aggressive Georgians, and they did not survive the troubled decades of the thirteenth century". ↑ Hodgson, Marshall G.S. (1977). The expansion of Islam in the middle periods Volume 1. University of Chicago Press. p. 262. ISBN 0-226-34684-6. 1 2 3 4 5 Luther, K.A. (December 15, 1987). "Atabakan-e Ādarbayjan". Encyclopedia Iranica. Retrieved October 28, 2010. 1 2 3 Peter J. Chelkowski, "Mirror of the Invisible World", New York: Metropolitan Museum of Art, 1975. pp 2;"During the last quarter of the twelfth century, when Nizami began his Khamseh, Seljuq supremacy was on the decline and political unrest and social ferments were increasing. However, Persian culture characteristically flourished when political power was diffused rather than centralized, and so Persian remained the primary language, Persian civil servants were in great demand, Persian merchants were successful, and princedoms continued to vie for the service of Persian poets. This was especially true in Ganjeh, the Caucasian outpost town where Nizami lived." Encyclopedia Iranica, "Atabakan-e Adarbayjan", Saljuq rulers of Azerbaijan, 12th–13th, Luther, K.
The history of Seljuq Turks from the Jami 'Al-Tawarikh: An Ilkhanid Adaptation of the Saljuq Nama of Zahir al-din Nishapuri. trans. and annoated by K. Allin Luther, e.d. by C.E. Bosworth (London, Curzon Press, 2001).